To know to how to add and subtract recurring numbers we need to know below basics. Decimals and the conventions of writing decimals. How to convert Recurring Numbers to Fractions? 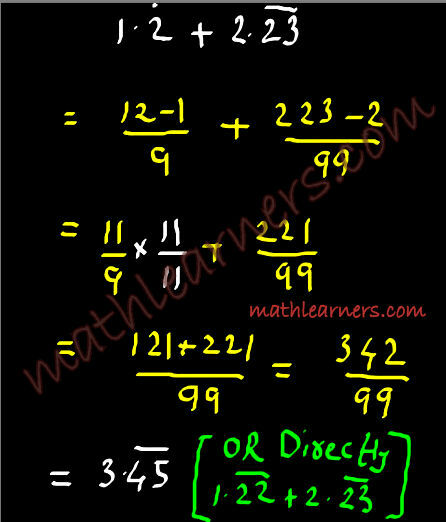 Decimals Numbers are numbers which are not natural numbers and which always has denominator other than 1. It’s denoted by a POINT between numbers. Here, Numbers before decimal (1 & 73) are called Integral Parts. 1.2 has ONE decimal place while 783.45 have TWO decimal places. 1.2 = 12⁄10 = 12 x 10-1 (1 Decimal Place so we moved decimal point 1 place forward and hence needs to multiply by reverse of that many powers of 10 i.e. 10-1). 783.45 = 78345⁄100 = 78345 x 10-2 (2 Decimal Places so we moved decimal point 2 places forward and hence needs to multiply by reverse of that many powers of 10 i.e. 10-2). 0.000123 = 123⁄1000000= 123 x 10-6 (6 Decimal Places so we moved decimal point 6 places forward and hence needs to multiply by reverse of that many powers of 10 i.e. 10-6). When we have very big number or very small number then we follow a standard form for writing decimal numbers. Standard form is to have ONLY ONE digit in Integral Part. 0.000123 = 1.23 x 10-4 (In order to get 1.23 we need to move decimal point 4 places forward. Hence multiply by reverse of that many powers of 10 i.e. 10-4). 987654 = 9.87654 x 105 (In order to get 9.87654 we need to move decimal point 5 places backward. Hence multiply by that many powers of 10 i.e. 105). 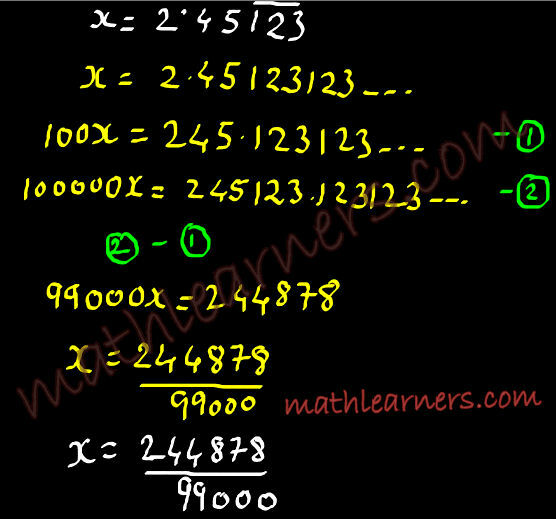 Recurring numbers are decimal number in which decimal values are continuously repeated. If complete set of Decimal Values are repeated then the recurring numbers are called as Pure Recurring Numbers. Note: Trick is to remove Decimal Values. For this we multiply by powers of 10 as required. 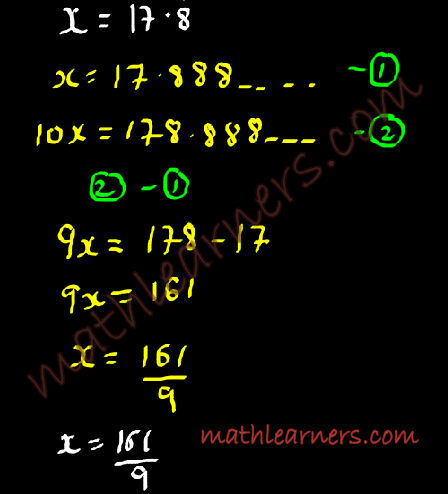 Depending upon the Pure or Mixed Recurring numbers and also the number of digits repeated we can write the General Form to convert Recurring Numbers to Fractions. Number of 9^’ s & 0^’ s as many that of Num.of Recurring & NonRecurring Decimal Digits resp. Finally coming the original topic – How to Add and Subtract Recurring Numbers. 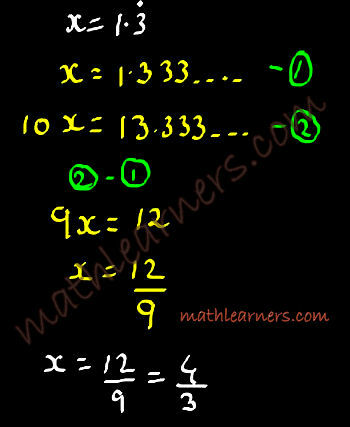 Convert Recurring Numbers to Fractions and then perform Addition or Subtraction. 1st compartment will have Integral Part as well as the Non Recurring Decimal Digits such that number of decimal digits remains same in the compartment so if it requires appending more recurring numbers then do so. 2nd compartment will have Numbers equal to LCM of Number of Recurring digits of both numbers. 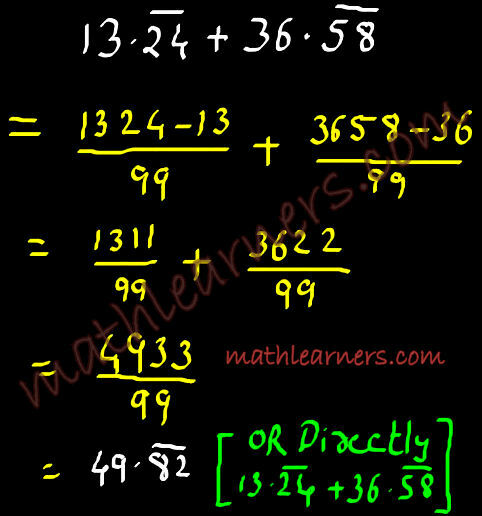 (In 1st example we have recurring digits as 56 and 235. So LCM = 6). 3rd compartment will have exactly 2 digits. 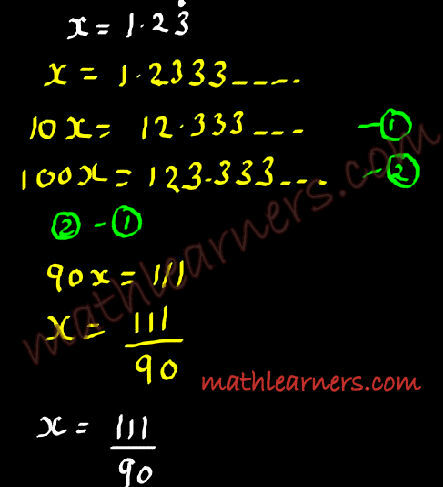 Perform Addition or Subtraction from Right – > Left. Discard the 3rd compartment numbers and rest will be the answer where 2nd compartment numbers will be recurring numbers. Thanks Kuldeep for stopping by ….